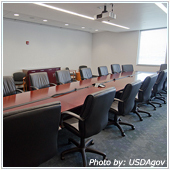 How Safe is Your Company’s Boardroom? Protection from the ubiquitous computer hacker is paramount for any business. Each year, billions of dollars are spent on security systems to keep confidential and sensitive data safe from those seeking to exploit it. How is it then, that we’ve forgotten about the one place where all of our vital business decisions are made? Boston based Rapid7 is a security company that specializes in finding holes in computer systems, and earlier this year their chief security officer, HD Moore, found a way to remotely spy on top firms’ conference rooms across the nation. Moore wrote a program that scans the Internet for unsecured videoconferencing systems, and found that by simply calling in, his researchers could not only see and hear inside boardrooms, but they could also move the camera and utilize its zoom. In less than two hours, they had gained access to 5,000 video conference systems. If a hacker can access your boardroom through your videoconferencing equipment; your company is left extremely vulnerable. Private conversations, trade secrets and privileged financial information are all up for grabs. By operating the camera using mouse gestures, a hacker could see who is present at your boardroom meetings. Silence will afford anonymity no longer. Once in, a hacker could also see who’s on your speed-dial and connect to any boardroom on your list, negating security measures that your colleagues or customers may have put in place. While time and money have been put into ensuring your videoconferencing equipment’s visual and audio clarity, it’s time to make security your number one priority. If you are still using unsecured systems set up outside firewalls, it’s time to evaluate the system and look at alternatives. In addition, systems that include a feature that automatically accepts inbound calls so users do not have to press an “accept” button every time someone dials in are adding to your security risk. Anyone can dial in and look around a room, and the only sign of their presence is a tiny light on a console unit. There are trade-offs with every connection you make from your business to the outside world. Make sure that you are aware of the risks and taking the security steps that are right for your company. Call us if you would like to make your boardroom more secure.